A website focused on cheating in games is up in arms as Blizzard cracks down on single player cheaters. It's not just multiplayer cheaters and hackers that Blizzard is targeting in StarCraft 2, it's people cheating in single player as well. An article posted on the Cheat Happens website said that a user had his account suspended for two weeks after using a trainer to modify the game, but only in single player modes and never online. 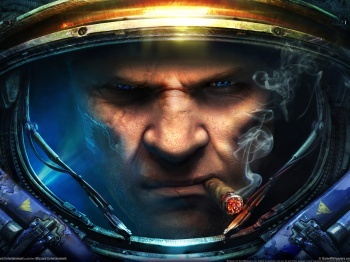 Blizzard justified the bans by saying that progress in the single player had some bearing on your multiplayer status, so by cheating in the campaign mode and in matches against the AI, players were effectively cheating in multiplayer as well. Understandably, Cheat Happens was unsatisfied with this response, saying that Blizzard is only after player's money, and the only effect that cheating in single player has is that the player gets a few achievements that they didn't earn. But the Cheat Happens website also has a financial interest in the matter, as it sells subscriptions that allow access to the trainers that got its user suspended. The site may appear to be on the side of the little guy, and it's quite possible that that is at least part of its motivation, but when examining the response, it can't be ignored that Blizzard's actions are a threat to Cheat Happens' business. StarCraft 2 already supports a number of official cheats, which disable achievements when activated, so it's hard to see the use of a trainer as anything other than a way to get achievements fraudulently. The achievements also unlock user pictures to be used in multiplayer games, and for those to have any of the value that Blizzard intended, they have to be difficult to obtain. The Cheat Happens site lists all the official cheats, but makes a point of saying that if you want to cheat and still get the achievements, you need to use one of its trainers. Being suspended - because that's all the action actually was, a two week suspension - for cheating in a single player game is still a pretty new idea, but when you parse out the situation out it becomes much more understandable. The user was trying to give him or herself a level of prestige he or she didn't earn, just the same as if you tried to artificially inflate your gamerscore on Xbox Live or your trophy count on PSN. For those reward systems to have any value at all, they have to be earned fairly. UPDATE: Blizzard has gotten in touch with us over the single player StarCraft bans, as it says there is some confusion about why they are happening. It says that the trainers that people get from sites like Cheat Happens often have multiplayer components to them, so to maintain the integrity of StarCraft 2's multiplayer competition, Blizzard is actively targeting anyone who uses them in any multiplayer mode, even if there are no human opponents present. Blizzard went on to say that people using third-party modifications in StarCraft 2 do so at their own risk, and that it takes cheating of any kind very seriously.